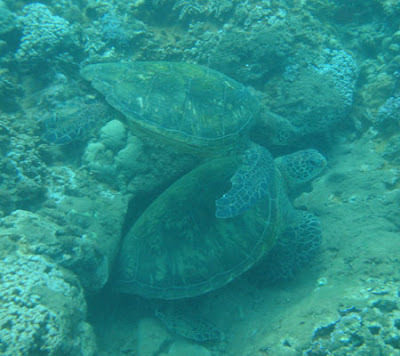 On a recent expedition to our favorite vacation spot, Maui, the Wondrous One and I stumbled upon a secluded cove filled with sea turtles. I guess “stumbled upon” is a tad ingenuous. I had only just emerged from the lovely waters of Napili Bay and had still a few drips left in my trunks, when I heard a woman seated no more than a half dozen feet from us speaking to what was obviously her husband, approaching from behind. “Did you see anything?” she asked, as the man came into view. Before his response, my ears perked up. 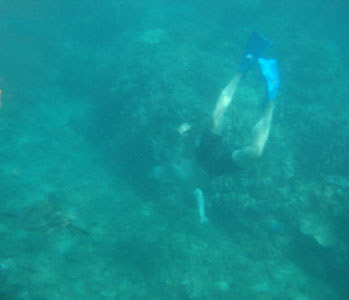 My latest snorkeling venture had gone unfulfilled. 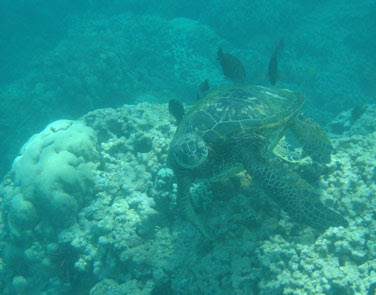 Sure, there were colorful fish aplenty of all shapes and sizes, but I was on the hunt for sea turtles. As he was coming from the direction of the water as I had, with snorkel and fins in tow, I was eager to hear if he’d had any luck. 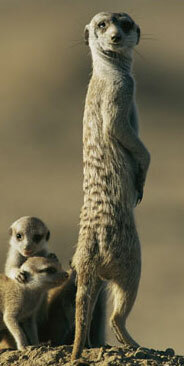 My body shot up like a meerkat’s. “What’d you see?” I asked. 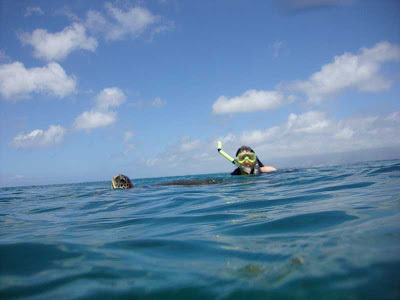 Snorkelers, as with any hobbyists, love nothing more than to share their latest successes and failures concerning such. If this were a comic book store, my question would be no more rude than my asking the subject of the exciting storyline I’d overheard two other fans discussing. Plus, the best way to learn of the unique and amazing things while on vacation is to keeps your ears open and your mouth even more so. Every travel advisor or guide, and most websites, are going to list the same ubiquitous “hot” spots, whether they be eateries, attractions, hiking trails or, as in this case, snorkeling and dive areas. But to find those things off the beaten path, you should never shy from asking the locals and other tourists. They’re the best way to separate the wheat from the chaff when it comes to find the real “bests” of a place. He then went on to tell me that there was a secluded cove a short walk away teeming with terrapins. As he pointed in the direction I should take, he stopped himself. “Why don’t I show you?” he said. Jim, whose name as I eventually discovered, in the way a stranger’s name is sometimes not nearly as important as the reasons you began to talk in the first place. Only much later—usually when parting—do you realize the social faux pas, awkwardly shaking hands and exchanging pleasantries before bidding adieu. Anyway, Jim led me along a path that emerged from the rocks book-ending the left side of the beach. Five minutes later I was sitting on a rock, overhanging the ocean in a natural cul-de-sac and makeshift body-launch, donning my fins and mask. My heart pounded with excitement. Sure, I’d swum with sea turtles many times before. 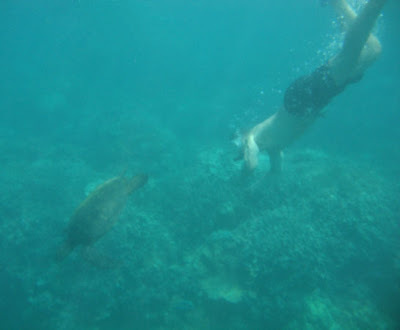 My success rate in tracking down the marine mammals was pretty good when it came to snorkeling along the coast of Maui. Usually my aquatic adventures included the triumphant discovery and subsequent joyful observation of these wonders of the deep. But Jim was talking about a bounteous harvest of the delightful creatures; not simply an area where there had been sightings—as if a there’d be a TURTLE XING sign posted had this been on terra firma—but rather a terrapin tenement complex, as it were. I had barely turned the corner out of this oceanic cavity when I spotted one… then another… and another! The place was crawling with them. I stopped count at sixteen. 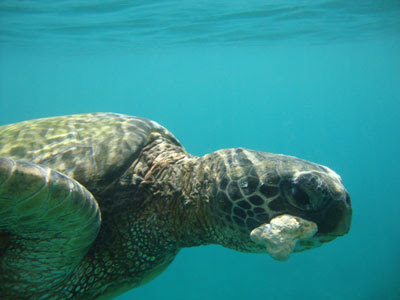 And like Merv Griffin’s “lovely bunch of coconuts,” there were “big ones, small, ones, some as big as your head and bigger!” A veritable smorgasbord of sea turtles, all in various stages of doing whatever it is that sea turtles do. Which isn’t much, mostly periodically wriggling from their underwater parking spaces, ascending, then poking their heads through the water’s surface to grab gulps of air before diving back to their spots, wedging themselves under and within nooks and crannies, in and under reefs and rocks. And it isn’t as if these deep-sea Gameras are reaching incredible speeds. 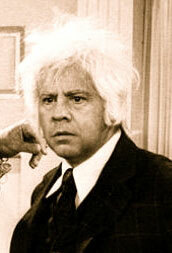 In a race, Tim Conway’s Old Man character from The Carol Burnett Show would win by a mile. Still, there is something calming and mesmerizing to their movements, like a slow-motion underwater ballet or the animal kingdom’s answer to mankind’s Lava Lamp, the turtles serving the role of amorphous globs that slowly rise to the peak of the glass container, only to descend once again. And to be amid so many was transcendental. Hence the term: Wondrous One! Upon my return to our blankets, where the Wondrous Audrey had decided to continue to bask in the sun’s warming rays while I went on my quest, I was giddy as a school girl who’d just had the hunkiest boy in class say “hi” to me. I babbled excitedly, using every superlative in my vocabulary; then going back and spouting hyphenated combos; only to descend to puerile elisions, like “phenominastic,” “stupendiferous” and the regrettable “unbelievalicious.” In Harlan Ellison’s name, I pray forgiveness. I averred to buy an underwater disposable camera and return upon the morrow to capture my Chelonioidea Shangra-La on film. 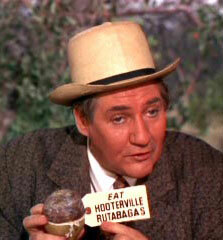 Now, I hadn’t used one of these nigh-useless devices since my and the Wondrous One’s wedding many years prior. If you’re lucky you’ll achieve a ten percent success rate. The main problem is that there’s no definitive way to aim the camera—no screen that shows you what’s in the frame—so you basically point it at what you hope to take a picture of and pray. The result is most often a fuzzy blob of bluish-green, as if painted by a watercolorist who didn’t wait for the colors to dry between applications. 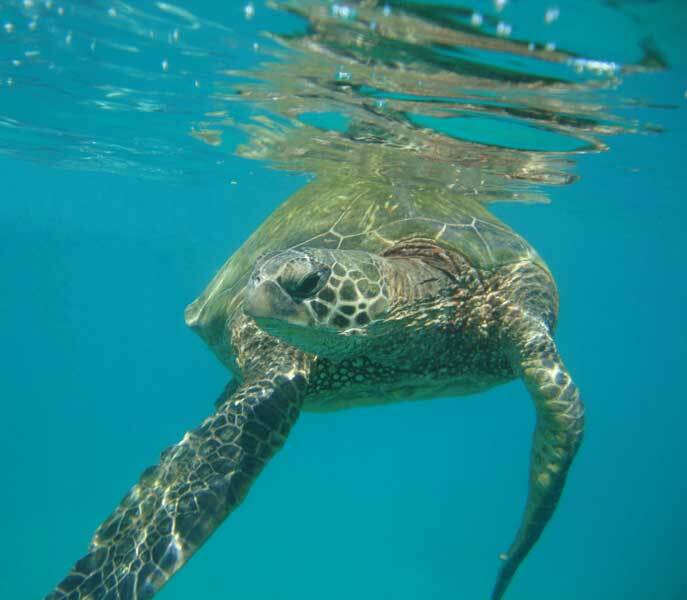 And capturing anything moving, even something as slow as a sea turtle, is as impossible as catching a fly with a pair of chopsticks (with respect to Mr. Miyagi). The things don’t work past a depth of ten feet, either. So even if you’re fortunate enough to frame the object of your desire, it’s like taking a picture of the performer at a concert from the Bob Eucker seats. But I hoped that technology had improved upon the design and I’d have better luck than in the past. Thus, on the way to the beach the next morning, I detoured to Boss Frog’s, the emporium for all things adventurous on the isles of Hawaii. 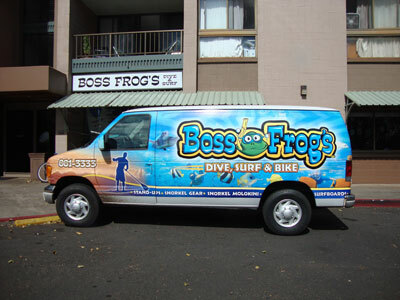 Boss Frog’s is where Wondrous Audrey and I rent our fins—we have our own snorkels, but you can rent those, too—every time we come to Maui. They have numerous locations on the island, ideal for picking up any last-minute accouterments you may need or forgot to bring when leaving the hotel. The store on the Lower Honoapiilani Road in Kahana is the one we frequent. The store’s Road-to-Hana tape—it was a cassette, when we used it on our honeymoon; I’m sure they have CDs now—was excellent. We bumped into others on the notorious Road—at gas pumps and such—and discovered in talking about the plethora of sights, to which we were directed by the informative Boss Frog’s tape, that other such travelogues were far inferior. And I always found the staff at Boss Frog’s to be informative and as far from unctuous salesmen as you can get while still being in retail. The workforce are all adventurers themselves, and as I mentioned above about hobbyists, they just want to share their knowledge and secrets as to what is cool on their turf. Such was the case with the camera. “Do you sell those underwater disposable cameras,” I asked uncertainly. There was a time when they smothered the shelves, but I hadn’t seen them in years. “Well… yeah,” came the answer, in the way a purveyor of a homemade ice cream stand would reply to someone who asked if he carried a nonfat variety. My ears went up and my head cocked, like a dog that had just been asked if it wanted a cookie. I swear I grunted as well. No guttural release was necessary, though. He could tell from my look that I wanted to know more. He pulled a black camera, the size of those used in films of the 40s, from behind the counter. The device, however, was surprisingly light. its size was due to the watertight casement that surrounded the true camera inside. Turns out, the gizmo was easy enough for even Yours Truly to use—check out the photos and video in the post. It had a large display screen and floated if dropped in the water. 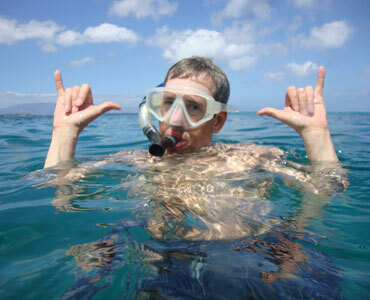 When asked what the contraption’s depth capacity was, my Hawaiian Mr. Haney merely scoffed. And the deep-sea doohickey could hold an umpteenth amount of video and a gazillion photos. Even so, the renter could bring the camera in at any time to get a fresh battery at no additional charge. And Boss Frog’s burned a DVD of everything for you upon the camera’s return. SOLD! After securing a good spot on the beach with our towels, I went to “Turtle Cove,” this time with the Wondrous Audrey in tow. My effusive gushing about the site had her curious to what marvels were in store. I should take a moment to explain, that Wondrous though she may be, in the water Audrey is—looks aside—no mermaid. She weighs nearly nothing when wet, yet sinks like a stone. I’ve tried teaching her the finer points of flotation, only to discover that the normal laws of physics do not apply with her. I believe she’d plummet in zero gravity. 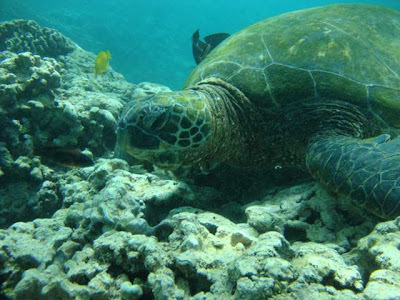 Still, she enjoys swimming and does so with a life vest, ever close to shore and clear of deeper waters. 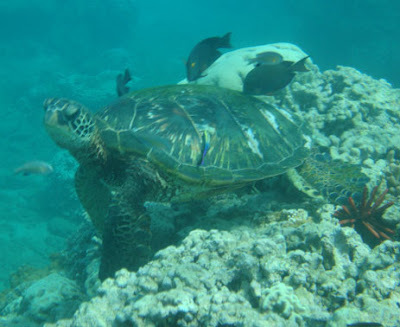 Fortunately, the waters off the coastline of Maui are stocked with fascinating fish and beautiful coral within feet of the shore, and thus have not curtailed her enjoyment of snorkeling therein. Hang loose, my Faithful Bloglodytes! Conversely, I’m the Man from Atlantis. My aquatic limitations do not come so much from being in the water as on it. I get seasick looking at ships in a bottle. You ever want to save money on purchasing chum, just feed me a good breakfast and have me accompany you on your fishing excursion. You’ll have all the chum you’d ever want. The cove was surrounded on three sides by land, making its waters quite calm. 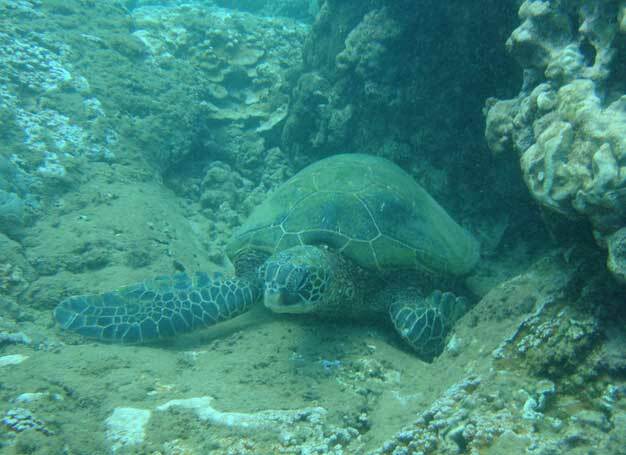 Still, the depth of the area where the turtles frolicked was a good twenty feet deep, anathema to the Wondrous One’s swimming. I hoped my enthusiasm and pleas, coupled with seeing the serenity of the area, would entice her to give it a try. I so wanted to share the turtle experience with her. As if on cue, as soon as I swam into their aquatic “borough,” they pulled out of their undersea parking garage and began massing around me. I felt like I was a slab of dead tuna in an Animal Planet “Shark Week” special and they were Great Whites. 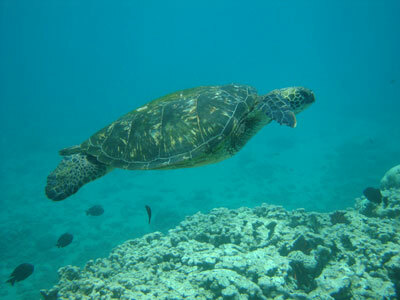 Now, harassing a sea turtle carries with it a steep fine. The creatures are on the endangered species list—though I’m happy to say, there numbers are growing—and not to be annoyed. 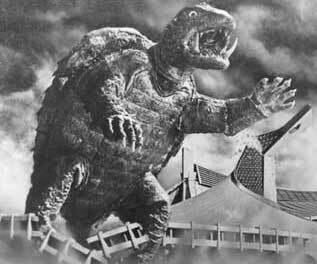 Unfortunately, no one bothered to tell the turtles that. They were swarming me. I’d back away from one fast approaching me and nearly collide with another coming in from behind. It was all I could do to remain still and hope they didn’t touch me. I felt they were all younger brothers teasing “I’m not touching you…” as I tried to get Mom to make them stop. I captured the moment on film, including my mumbled epithet when they mugged me. The camera was a dream to use. I took reams of footage and oodles of pictures, all the while fighting the conditioned notion—ingrained from decades of taking pix with a camera that allowed 36 shots at most and no video—that at any moment I’d have filled my shutterbugging quota. How refreshing to be able to shoot with abandon, never “waiting” to get the perfect shot, so as not to waste precious film, nor fearing a premature cut-off to a filming sequence. Sure, there were klunkers, especially when attempting to capture my flippered friends the split second they poked their heads above the water for a breath. As with most of today’s cameras, there is a moment’s hesitation between depressing the shooting button and the device actually taking the picture. 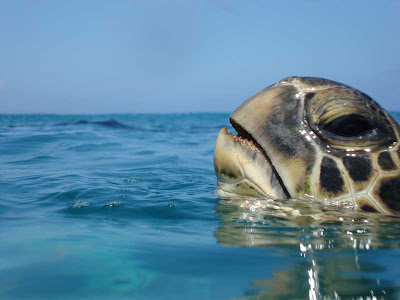 So I’d have to anticipate the creature’s moves, break the surface just before I believed it would, and be ready to snap the instant the turtle’s beak peeked out of the water. Hey, you look just like a guy I saw down by the coral! And I’d swear the little bastards were playing me. They’d shoot to the surface and juke me into thinking they were about to pop their heads, only to have me break the surface and take a quick shot of… the ripples of the water above their sneaky shells. The minute I re-submerged, they’d tale their breaths. 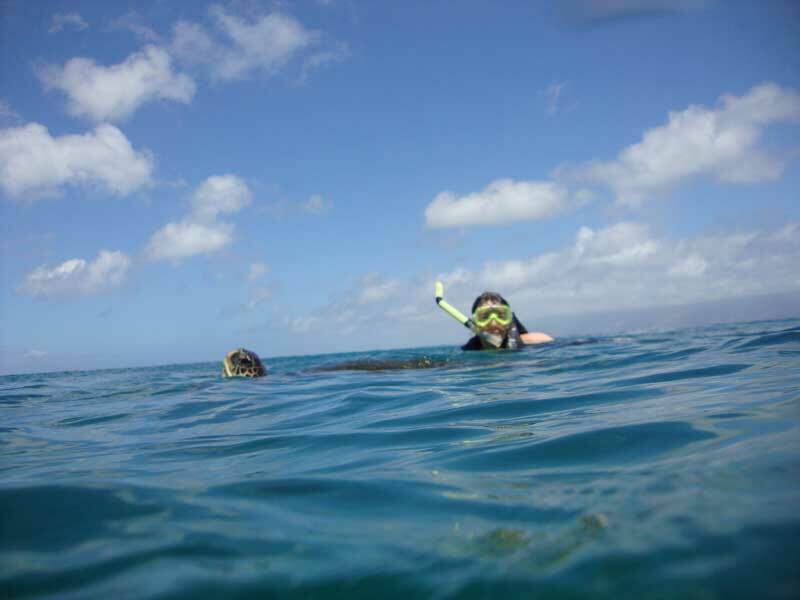 But I did manage to capture the moment on several occasions, including one impressively timed shot of Wondrous Audrey smiling at the camera while a turtle’s head burst into the frame. Cut! Okay, who let the human into the frame? Far easier to film the breathing sequence, though it was sometimes difficult to keep the underwater animals in the frame, especially whilst diving beneath the surface to get a closer shot. And the zoom feature—did I not mention the zoom?—also played with the director’s perspective, adding another component to be aware of. When I emerged, Audrey sounded like me the day before. 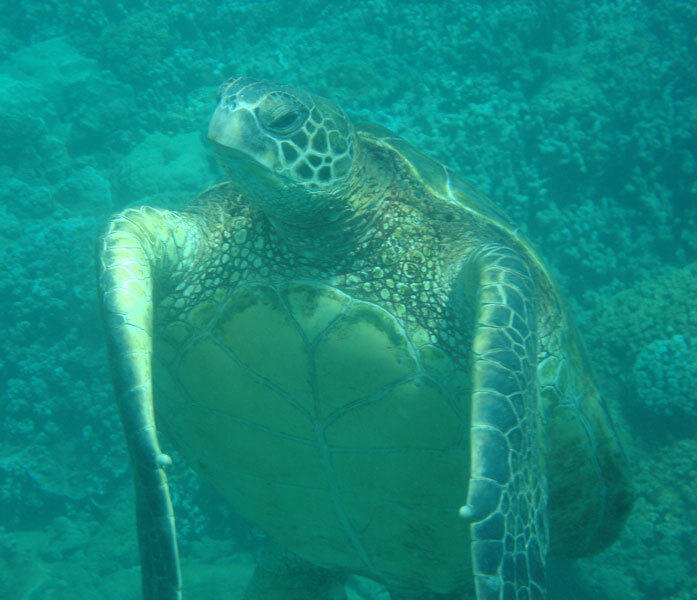 From her perch on the verdant knoll overlooking the dive spot, she could see the turtles; their shadows under the surface and their heads popping up like a marine version of Whack-A-Mole. She agreed to join me the following day. Whether you’re shell or gauze. 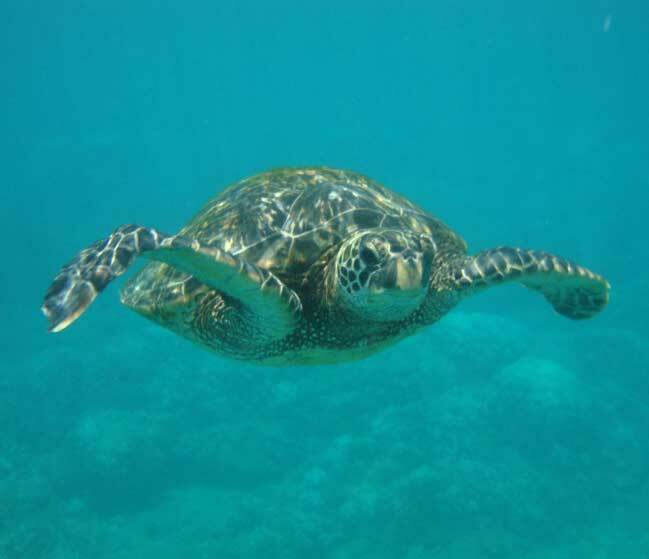 Although the primary reason for coaxing the Wondrous One into the cove was to have her share in the sea turtle experience, I did also want to utilize her inner Scorsese to take some shots and footage of moi. My reasons were far from egotistical. Humility is a trait I pride myself in being the best at. I wanted nothing more than proof of my own maritime movies to curtail any jealous naysayers in the Ethernet who might suspect duplicity once they’ve viewed their awesomeness. Audrey’s discomfort in the water made handling the camera more difficult, but she managed to get a few great pix and footage. More importantly, she and I now share the marvelous swimming-with-sea-turtles experience. All told the camera cost a mere $35 for two days’ usage and a lifetime of priceless memories. Thank you Boss Frog’s!